Meet Jennifer Cramblett of Ohio. She’s the woman on the right. 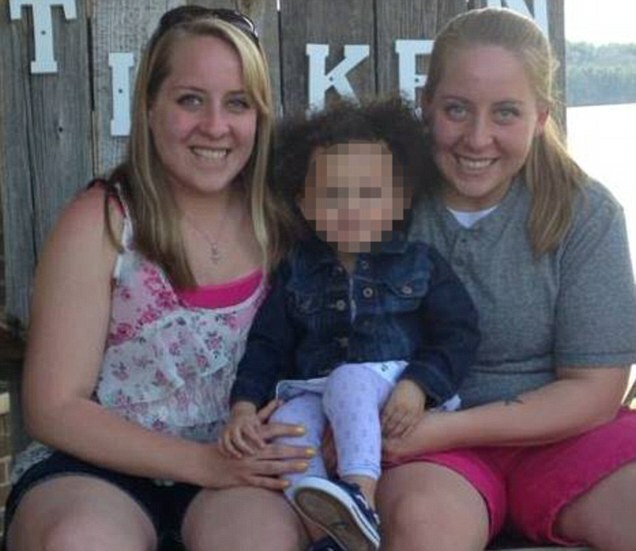 The woman on the left is her partner Amanda Zinkon. It’s nice to live in a world where we can see what is portrayed as a happy “lesbian couple” and not think twice about it. But this story is a bit more complicated. The girl in the middle looking all pixelated is Payton, their daughter. She is now the center of an uncomfortable lawsuit. Mom Jennifer decided to sue the sperm bank that inseminated her because the “donation” was from a black man; hence, Payton is biracial. “There are things I don’t feel I have the background to even know. It is things we have to go out and research and talk to people and figure out how to do as simple as a daily chore of doing your hair,” Cramblett told CNN. Jennifer is seeking more than $50,000 in damages for “wrongful birth and breach of warranty, citing the emotional and economic losses she has suffered” from Midwest Sperm Bank in upstate Illinois. 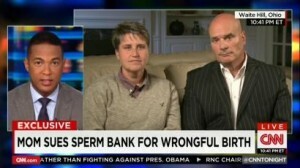 Cramblett’s suit says she and her partner, Amanda Zinkon, requested sperm from white donor “No. 380” in 2011. Once Cramblett was five months pregnant, the couple then ordered more sperm from the same donor for Zinkon to use. When they received sperm from African-American donor “No. 330,” they realized a mistake had occured. Here’s what is so uncomfortable: Payton is loved unconditionally, but when she is old enough to Google herself (admit it, everyone does that — even you), this unfortunate lawsuit will sit atop the search results. Talk about crisis communications. And here’s the rub: Jennifer is suing not because of Payton’s skin tone but because of the community in which they live. In the suit, Cramblett lists some of the difficulties she faces in raising a mixed-race child, saying she’s unwelcome in the “black neighborhood” she visits to have Payton’s hair done, fears her intolerant and homophobic parents will not accept her daughter, and that it would be a hardship to relocate to a racially diverse community as therapists have suggested.